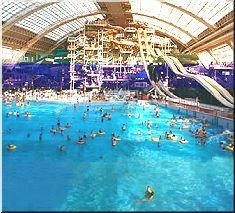 Visit Alberta's Capital City to experience shopper's heaven - West Edmonton Mall. This is the largest shopping and entertainment complex in the world, and is a great day trip out of Jasper. Enjoy approximately 4 hours at the mall and take in the fun-filled amusement park, the relaxing waterpark or any of the 800 shops and restaurants that it has to offer.